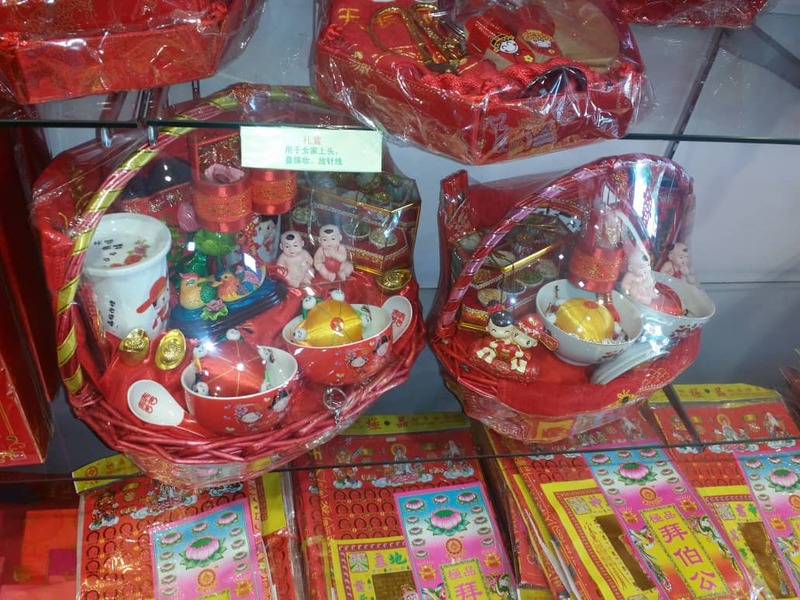 In traditional Chinese customs, prior to the wedding, there is the Guo Dai Li (过大礼) ceremony where both sides of the bride and groom exchange gifts for one another. Then there is the installation of the bed and on the wedding day, the tea ceremony. If the parents/grandparents are of traditional type, they are often very particular or strict about the ceremony. 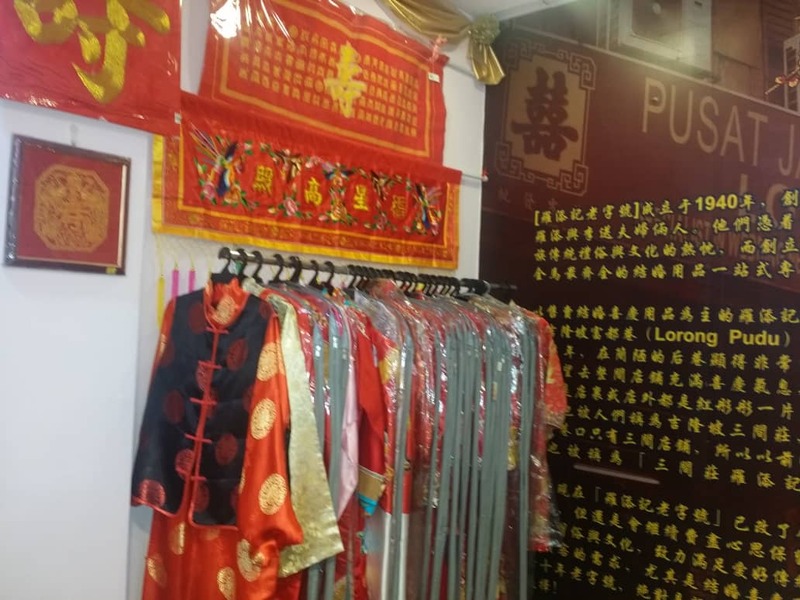 Modern generations who are not so knowledgable with regards to the Chinese customs but are forced obligated to keep up with tradition would probably need to visit a shop that specialises in selling items for traditional Chinese weddings. 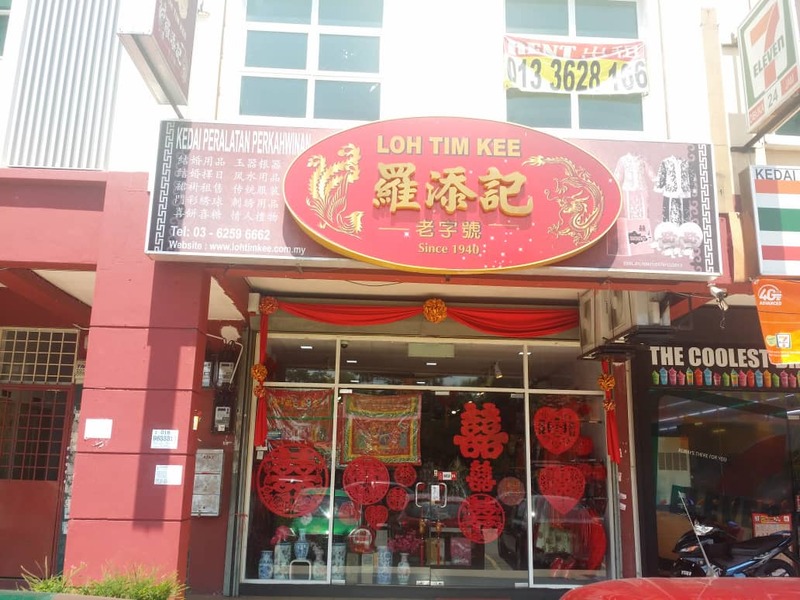 One of the more well known shop in selling traditional Chinese wedding items (everything you need from the stickers, bowls, tea cups, plates, decorative items, potty, special ruler to the traditional Chinese wedding gowns for the bride and groom) is Loh Tim Kee. 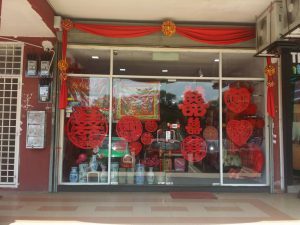 The outlet above is located in Kepong and it acts like a one stop center selling all the wedding items. 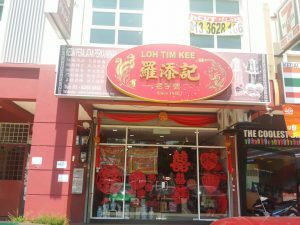 If you plan to visit Loh Tim Kee, do your best to bring along someone who is experienced and well versed in the customs of the Chinese wedding- like a relative, auntie/uncle or your parents. If you walk in to Loh Tim Kee with your girlfriend/boyfriend, being starry eye and all… and knowing next to nothing on Chinese wedding customs, you may ended up being persuaded to spend a LOT of money for items (some really overpriced and may not be necessary) that you can get cheaper elsewhere if you know how to assemble these items. Example prayer items can get from shops selling josstick products and dry foodstuff can get from other suppliers. However if you do not have any person who could guide/willing to guide, then look on the bright side- a wedding is once in a lifetime event and you do get ‘free’ advice and consultation as the salespersons are experienced and can go into detailed explanation on how to use the products. You would only need to buy their products for them teach you. And they do have detailed step-by-step printout in Mandarin (not sure if there is any version in English). 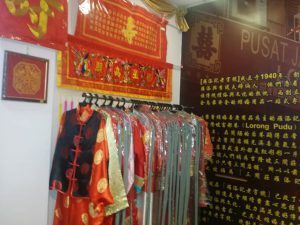 Above and below: Traditional Chinese wedding clothings for the bridegroom and bride. In Malaysia, some Chinese craft or gift shops may sell some of the items required for traditional Chinese weddings. 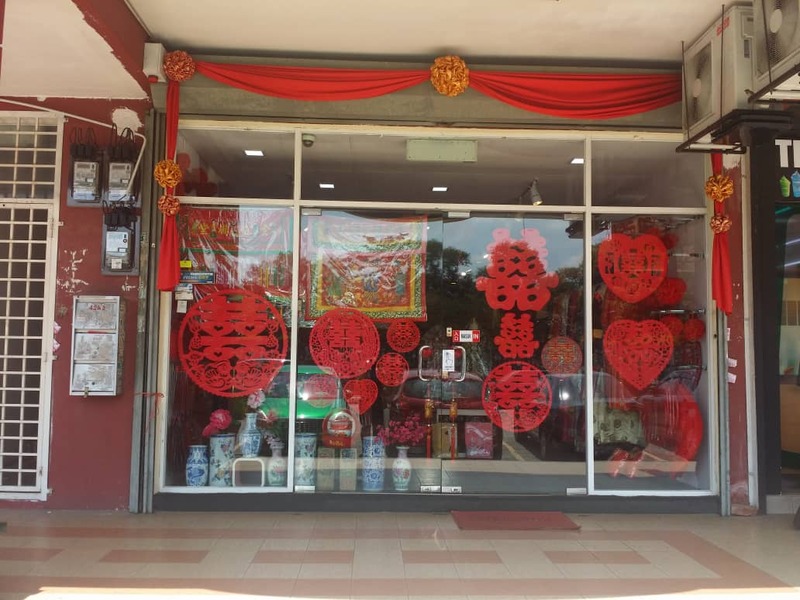 However, the listing is often not complete, ie it is not a one stop place for all items…for example you may get the potty and tea ceremony items but for the jossticks, you need to get from the joss stick shop. Often, they may not have fully knowledgeable staff who can give you advise on what need to be done and maybe have contacts for a ‘tai kam cheh’. Chinese wedding is really a specialised field and there is a lot of ‘procedures’ that needs to be adhered to. 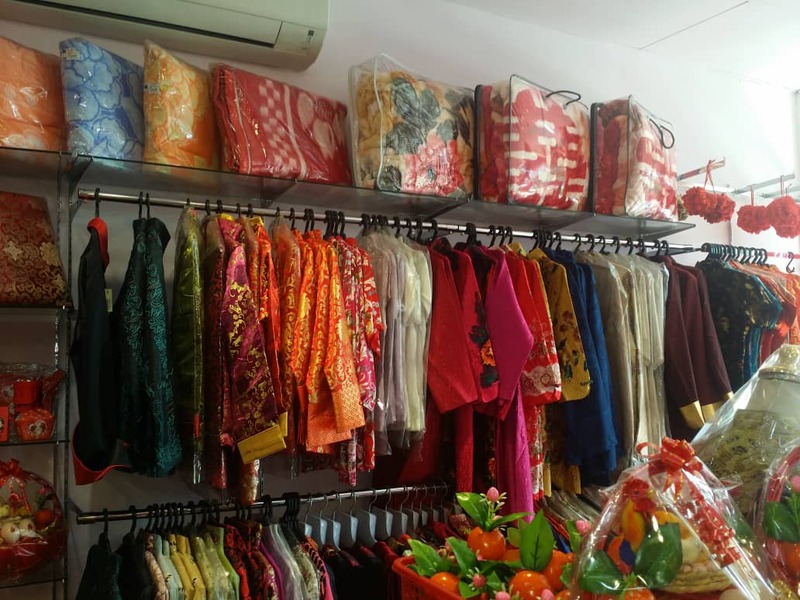 The items sold at Loh Tim Kee may not be the cheapest price- but they are literally one stop for shopping for traditional items. You are also paying for experience as their sales staff would spend a few hours explaining to you on what are the required items, how to use and arrange these items. In the olden times, items are often bought separately by the parents of the bride and groom. 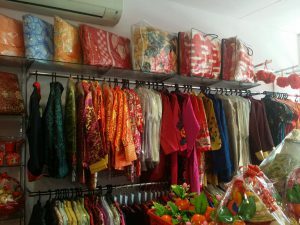 Often they are knowledgeable of the entire process and the required items that they could get these items separately. However the soon-to-be-wed couple – if they are buying these items may visit the shop together and buy all the required items. The sales staff would explain the uses and of course add on to the listing. Each side would usually be expected to spend about RM2k on the items. In the next article, I would be listing the Chinese wedding items that you may probably end up buying.